What is the best way to sync music from iPhone to iTunes? Usually, people gather their favorite songs from a variety of sources. And all songs are bundled up in just one iPhone. 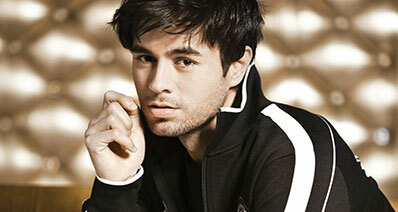 But when some error arises in iPhone or you upgrade it, then the songs are at risk along with other data. You can never know what problem can arise during a simple upgrade. Another scenario when you will need to sync songs from iPhone to iTunes is when you are purchasing a new iPhone. Buying a new iPhone means that, you have to transfer all the data from one iPhone to another. And transferring un-purchased songs via iTunes is not really possible. Thus, you need to learn how you can sync all songs from your iPhone to iTunes so that you can access them on your new iPhone. Here in this article, you will learn how you can sync the songs present in your iPhone 6/7/8/8Plus/X/XR/XMax to iTunes. When You Upgrade Your iPhone: When a person is about to upgrade the iOS software, the entire data is at risk. But you can also update your iPhone software within iTunes. Plus, using iTunes for the upgrade is much better and safer. Recover Lost Data: Another reason why you should think about syncing your iPhone data with iTunes is to save you from data loss during operation. The data can get lost easily by random deletion, system crash, and many more. But if you are synced with iTunes, then you can easily recover the data that you lost. Save Device Space: If you keep your iPhone synced with iTunes, then you can easily save up your iPhone internal storage space. You can easily access the data with the iTunes server. Still, there are some features that are lacking in iTunes. You can’t sync up all music files with iTunes as it only allows the Purchased songs to sync. Thus, for complete sync up, you will need a third party tool like iMusic. The easiest and most efficient method you can try to sync up iPhone to iTunes is using iMusic software. This software is a complete music management tool for all devices. The iMusic application can be the most useful software for you. The iOS device users can easily sync songs from iPhone to iTunes without any hassle. The software is designed so that it can be used as an all-purpose tool for the music files. You can download, browse, and record music from various music sharing website in a single click. In addition, the software allows you to perform selective sync of songs present on your iPhone. This tool is like a one-stop solution for all your problems. Simple clicks to meet your needs about how to sync music from iphone to itunes. Copy Files to iOS/Android Devices. Put music, photos, playlists, videos, audiobooks and more from Mac/PC to iPhone, iPod touch or iPad. Download Music from 3000+ Sites. 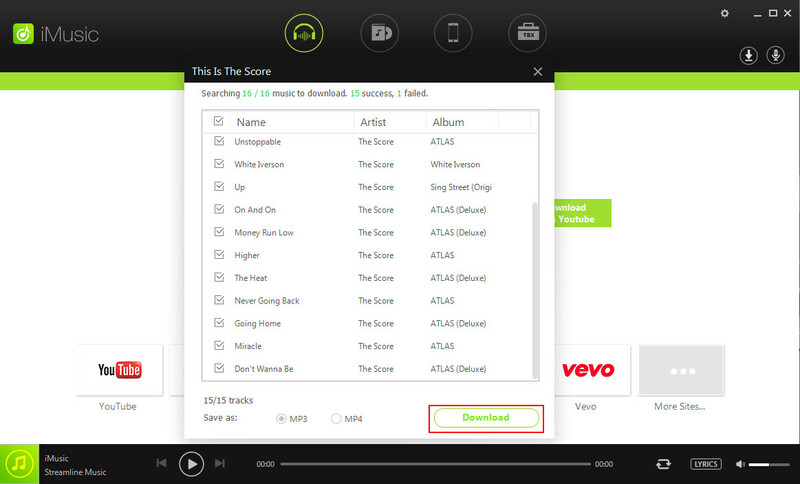 Download music from YouTube, Dailymotion, Spotify, etc 3000 music sites for free. Record Music from Radio Stations. Record any song that you can play on your PC/Mac with ID3 tags attached. Create your music library from thousands of online music sites or music playlists to enjoy anywhere. Transfer songs/playlists/podcasts/iTunes U from iTunes Library to iPhone, iPad, and iPod without erasing the existing data on your iPhone, iPad and iPod. Record unlimited songs from all accessible websites on your computer. 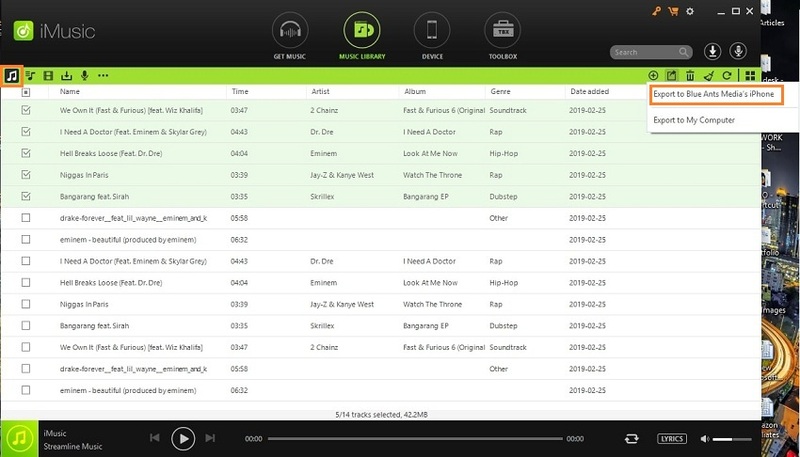 Enjoy built-in music library to browse and preview the latest and trending songs from websites online. Automatically save feature for the download or recorded music to the main library for easy transfer and better management. Download songs without considering the high-quality or format support as the software have a wide array of file format and quality support. Launch the software on your computer and connect your iPhone with it. 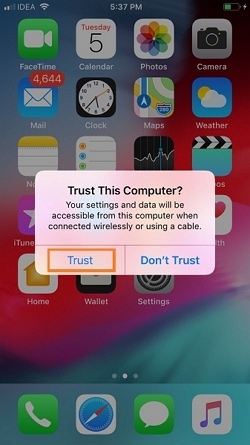 As you connect the device, it will ask you if you trust the computer and want to allow the device access. Tap on the “Trust” option and the device will be connected with the software. As you switch to the device tab, you will see the iPhone information along with various options on the right side of the screen. Choose the “Transfer Music to iTunes” option and you will be directed to another screen. The software will scan your device for the music files and display the scanned data on the screen. To initiate the scan, tap on the “Start” button and let the software scan the device for files. Once all your music, music videos, movies, TV shows, podcasts, audiobooks options are listed on the screen, you can try out two methods to sync them. Direct Copy: As the file types are listed on the screen, you only need to click on the “OK” button to sync up the files with iTunes library. Export Files: If you don’t want to sync everything, then you can perform selective sync. For this, click on the Music icon in the menu bar and the songs available in your iPhone will be displayed on the screen. Select the files by ticking on the box in front of the files and then right click on the selected files. This way, you can directly export the files to iTunes. You can also click on the Share icon on the right side of the menu bar and directly transfer the songs from iPhone to iTunes. With a similar process, you can also sync playlists, podcasts, audiobooks, and other music files from iPhone to iTunes. Using iTunes is like the most ideal thing iOS users can do to make sure that their device has a backup of their data. But as the third party tools are offering more features than iTunes, people are turning the stream and choosing them instead. But that doesn’t mean that iTunes simply lost its value. The application can come in handy anytime. The major advantage of using iTunes is the media sync option, simple process, and access to Apple support. Thus, it is vital that you know how to sync songs from iPhone to iTunes too. Even though iTunes can only sync the purchases still it is a quick and easy process to transfer the files. But before you do anything, make sure that you have the latest version of iTunes installed on your computer. Here are the steps you need to follow to sync music files from iPhone to iTunes. Step 1: Launch iTunes on your computer and connect your iPhone with it. As the iPhone is connected, iTunes will detect the device and display a small icon in the upper left corner. Click on that icon and you will be able to see the iPhone information. Step 2: By default, the Summary tab will open up. Select the Music option from the left side panel and you will be able to see the Sync Music option on the screen. Step 3: Tick the box in front of the Sync Music and as you apply the changes, iTunes will automatically sync the songs from your iPhone to iTunes library. You can further select the music that you wish to sync with iTunes like playlists, artists, albums, genres, videos, voice memos, etc. From now on, your device will be automatically synced with the iTunes library. Step 1: Launch iTunes and open your iTunes library. As the library open up, you will see the songs listed in the interface. Click on the song to select it. Step 2: If you want to delete multiple songs at once, then select as many files as you want to delete. To select the multiple files press the Command/Windows key while you click on the song name. Step 3: There are several ways that you can use to delete the songs from iTunes. You can click on Delete key on the keyboard, go to the Edit menu and choose the Delete option, Right-click and choose delete option, or choose the delete icon in front of the files. Step 4: As you click on the Delete option, iTunes will prompt you to choose from Remove download or Delete song option. The Remove download option appears when Apple Music or iTunes Match has downloaded the song. When you select this option, the file that is taking up space will be deleted but the entry in the library will stay intact. While the Delete Song option will delete the song from your library entirely and move it to trash. So, the choice is yours that you want to use to delete one or multiple songs from the iTunes library. But when you sync the songs from iPhone to iTunes, there are some limitations too. Whether you are syncing or removing the files from iTunes, there are some things that you should always keep in mind. You can’t sync the songs which are not purchased from the iTunes store. You can sync music files from different iTunes library to the same iPhone. You can use iTunes if you want to add only one song in the library. Sync iPhone Music to iTunes with simple clicks. Conclusion: As you can see, there is no doubt using iTunes to sync music files, is not a brilliant idea. 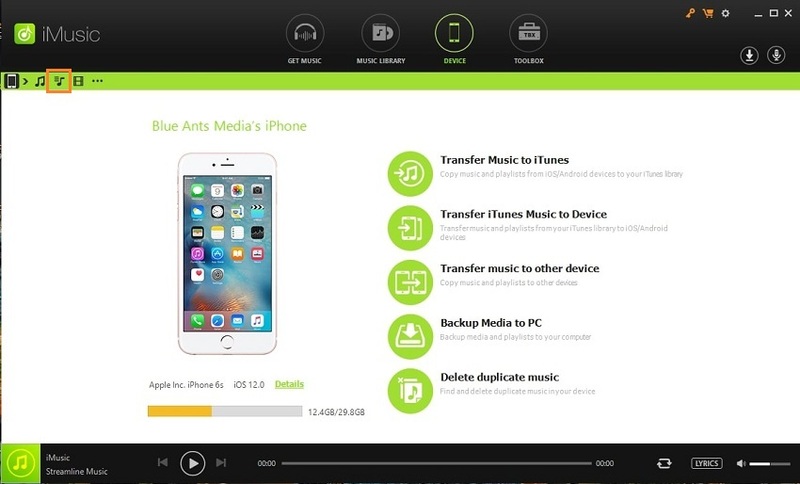 You need to make sure that you have a backup of all the songs available on your iPhone. Therefore, it will be better if you learn how to sync music from iPhone to iTunes using iMusic. After all, this tool is easy to use and allows the users to manage the files in the iPhone in an efficient way.